In last month's newsletter we discussed the effective diffusion coefficient. This month we continue on this theme with a discussion on the tortuosity. Tortuosity plays an important role in the diffusion of a species in groundwater, and is used in some effective diffusion calculations. Tortuosity is a parameter that describes the path taken by the groundwater or species through the porous medium, relative to a direct route. It is the actual length of the flow path, which is sinuous in form, divided by the straight line distance between the ends of the flow path. In the figure above, the straight line distance is given by the red arrow, whereas a potential flow path is given by the blue line. 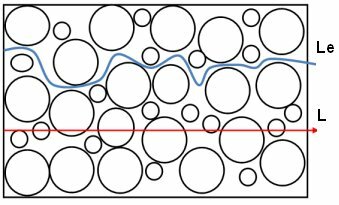 It can be seen that the potential flow paths can be significantly longer than the straight line distance in porous media. Tortuosity cannot be determined in the field, and thus the experimental approach is used for determining a value. The equation used for tortuosity is given by Le/L where Le is the length of a flow channel for the fluid, and L is the straight line length between the ends of the flow path. What are typical values for tortuosity? Ranges for tortuosity have been given between 1.25 and 1.78. The Solinst 101 Water Level Meter can be used to measure water levels in wells, and thus determine the flow regime in groundwater. This is the first step towards understanding how water, and associated species, move in the subsurface. Freeze, R.A. and Cherry, J.A. (1979). Groundwater. Published by Prentice-Hall, Inc., Englewood Cliffs, NJ. The Model 101 Water Level Meter is used for measuring the depth of water in wells, boreholes, and standpipes, and is the most accurate and reliable of the Solinst meters. It is easy to operate and read to 1/100 ft. or to each millimeter.